August 11, 2008: There are places on the Moon where the sun hasn't shined for millions of years. Dark polar craters too deep for sunlight to penetrate are luna incognita, the realm of the unknown, and in their inky depths, researchers believe, may lie a treasure of great value. NASA is about to light one up. Sometime between May and August 2009, depending on launch dates, the booster stage for NASA's LCROSS probe will deliberately crash into a permanently-shadowed lunar crater at 9,000 km/hr, producing an explosion equivalent to about 2,000 pounds of TNT (6.5 billion joules). The blast will jettison material out of the crater into broad daylight where astronomers can search the debris for signs of lunar water. Water is the treasure. NASA plans to send people back to the Moon by 2020 and eventually set up a lunar outpost. Water would be an invaluable resource for astronauts living and working on the Moon. Not only could people drink it, but water could be used to grow plants for food, or it could be split into hydrogen for rocket fuel and oxygen to replenish the outpost's air. It even could shield astronauts from dangerous space radiation. Hence the kamikaze mission, called the Lunar CRater Observation and Sensing Satellite (LCROSS), to search for H2O on the Moon. "If LCROSS's booster stage hits a patch of lunar regolith that contains at least 0.5 percent water ice, water should be detectable in the plume of ejecta," explains Anthony Colaprete, principal investigator for LCROSS at NASA's Ames Research Center. 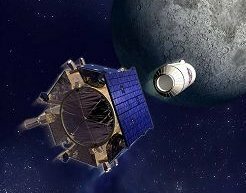 The other half of the LCROSS mission, a robotic satellite, will observe the impact and then itself crash into the Moon 4 minutes later. Most of the Moon is bone dry, of course. With virtually no atmosphere and 300° temperature swings between night and day, most of the Moon's surface is a hostile place for water. But there are a few cold, dark places where frozen water could stay put. At the lunar poles, the sun is always low on the horizon, so some crater ridges cast shadows that keep parts of the crater floors in perpetual darkness. Temperatures in the inky black shadows hover around 40° above absolute zero (-233° Celsius), cold enough for water ice to survive indefinitely. "There's tantalizing evidence that water might be there," Colaprete says. A lunar orbiter called Clementine detected hints of water ice in some of these craters in 1994 and so did the 1999 Lunar Prospector mission, but unfortunately the data were not conclusive. That's where LCROSS comes in. Ice blasted into the sunlight by the impact would vaporize. Ultraviolet light from the sun would then split the H2O molecules into H and OH. Mission planners hope LCROSS's sensors will detect the fingerprint of H20 in near-infrared light and also a characteristic wavelength emitted by OH at 308 nanometers. Above: The "life cycle" of LCROSS's impact plume. Click on the image to view a larger diagram and more information. Currently, Colaprete's team is searching for the best impact sites inside various shadowed craters. "The first and most important criterion is that we think the impact area will be productive from an ejecta standpoint," Colaprete explains. "If we don't get ejecta into sunlight, it wouldn't matter if we hit an iceberg because we would never know it." For example, if the impact site is close to a high crater wall, the ejecta would have to travel far to get out of the wall's shadow and reach the sunlight above. And if the impactor hits a steep slope in the bottom of a shadowed crater, much of the ejecta would blast out sideways instead of upward toward the sunlight. So a good site would be relatively flat-bottomed — less than about 15° of slope — with a fluffy regolith free of large boulders or rubble that would blunt the blow. Colaprete says that, so far, one of the best sites appear to be in a 17 km-across unnamed crater just west of Peary crater (88.6° N, 33.0° E), near the Moon’s north pole. "We've gone through essentially every possible launch date and picked a crater [for each date]," he says. Choosing impact sites must also take another factor into account: visibility from Earth. Hundreds of amateur and professional astronomers will join the LCROSS robotic orbiter in watching the crash. The explosion itself will probably be hidden by the walls of the target crater. Instead, what astronomers will look for is the impact plume. An expanding cone of ejecta will rise more than 6 kilometers above the lunar surface and spread outward for about 40 km in every direction. Glistening in the sunlight, the debris is expected to shine like a 6th to 8th magnitude star—invisible to the human eye but an easy target for backyard telescopes. Colaprete's team will time the impact so that it happens while the Moon is high in the sky at night in Hawaii. There, LCROSS scientists will observe the ejecta plume with the powerful Infrared Telescope Facility. But astronomers on the west coast of the U.S. and in Japan could be able to see the impact as well, depending on the precise impact time. "It really is going to turn into an international event," Colaprete says. "Everyone's going to be training their eyes on the impact to observe it." Stay tuned to Science@NASA to find out how amateur astronomers can collaborate with LCROSS scientists to help make this historic search for water on the Moon a smashing success. will travel to the Moon as a co-manifested payload aboard the launch vehicle for the Lunar Reconnaissance Orbiter (LRO). LRO is designed to map the lunar surface and characterize landing sites for future missions.